The eye is the organ in our body that gives us sight.? There are various types of vision defects which often result from a difficulty in focusing light from objects to the retina.? Correction is possible through the use of a lens, but an optometrist needs to decide on the strength required. Cornea ? The cornea covers the front section of the eye.? It is convex-shaped, tough and transparent.? The cornea refracts the light as it first comes into the eye. Iris ? The iris contains muscles that adjust the size of the pupil.? The iris is the coloured section of the eye.? It is able to control the amount of light that enters the pupil. Pupil ? The pupil is the hole that is found in the middle of the iris.? Light passes through the pupil to enter the eye. Lens ? The lens is a transparent disc.? It is bi-convex, flexible, and is found behind the iris.? The ciliary muscles are attached to the lens by the suspensory ligaments.? The lens refracts light, and is able to adjust the amount of light. Ciliary Muscles ? The ciliary muscles connect to the lens via the suspensory ligaments.? These muscles adjust the shape of the lens to the curvature required for the refraction of the light. Suspensory Ligaments ? These ligaments are the connection between the ciliary muscles and the lens.? These ligaments perform a similar function to the ciliary muscles in controlling the thickness and amount of curvature to the lens. Retina ? 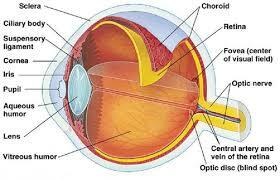 The retina is at the back of the eye and contains rods and cones.? These are light receptor cells.? Rods are able to adapt to dim light, and monotone colour, while the cones are able to detect colour.? The rods and cones send the electrical impulses to the brain. The Optic Nerve ? The electrical impulses are carried to the brain via the optic nerve.